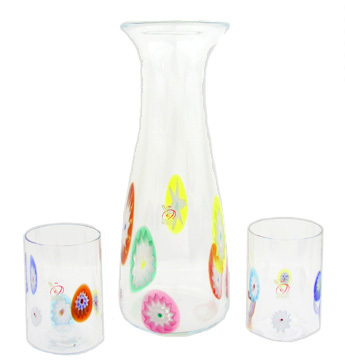 Mouthblown Murano glass crystal and millefiori carafe and 2 drinking glasses. The millefiori is random in color, shape, placement and size. It begins as a clear carafe and then during the blowing process, slices of millefiori canes produced in the same furnace in Murano, are placed on the molten glass. Continued blowing produces the distinctive patterns. The carafe is approximately 10 1/2 inches tall and the glasses approx. 4 inches tall. A mixture of the traditional Venetian glass with a more modern style which fits in today's home decor.